Pitching Central | "Real Coaching Solutions to Real Pitching Problems!" 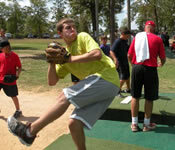 Find products focused on improving the skill of pitching from Coach Ron Wolforth. Increase the hitting potential with these products from the Texas Baseball Ranch. Resources for improving softball hitting and pitching skills. A key component to a skilled athlete is building strength and conditioning the body. Find baseball-specific strength training here. It’s great to start early, but to maximize potential of young athletes the proper development is critical. This program is designed to build athleticism, develop dynamic strength, enhance explosiveness, add to natural power and elastic body movement, increase neuromuscular efficiency, speed up arm action, as well as allow for freedom of the individual & his personal preferences. With your purchase of any Pitching Central product, you receive a 12 Month, 100% Money Back Guarantee. What does this mean? It means that you take the product. You review it. You implement it. Then if for any reason you don’t like it, your pitchers don’t improve using it or you simply decide it wasn’t what you expected, return it for a full refund (minus shipping & handling). No questions asked.